Discussion in 'TV: Reviews' started by michaellevenson, Apr 22, 2017. Anyone interested in the possible genesis of The Omen, this is the episode Dr Omega mentioned above. With Patrick Troughton and Diana Dors, it's eerily like the Omen movie as Diana Dors plays the Billie Whitelaw emissary from.Satan character , collecting souls from an American ambassador! Ring any bells? Remembering of course that this came first. Thriller was spooky Saturday night entertainment back in the seventies! I bought the box set years ago for my wife which cost me £75 as I recall and I know it's probably much cheaper now! I had never seen this Diana Dors episode until you mentioned it some time ago Michael, which prompted me to watch it - and yes, the parallels are almost appalling; suspiciously so! Troughton popping up is the icing on the cake! Available on youtube a must see episode, Killer in every Corner, with Patrick McGee and Don Henderson. A professor invites students to his home where criminal psychos are used as staff. Also with Eric Flynn, son of Errol, and Petra Markham, Mickey from Ace of Wands. The opening scene of Henderson and a meat cleaver sets the tone. That is one episode that I remember from childhood! The lunatics working for the Doctor and you have to guess who the final nutter, Armitage, was at the end! hilarious the way that McGee pronounces Boz when he calls for Don Henderson's character! The reporter, Petra Markham I think it was realises that he, Boz, is really Bozstein, a notorious killer who disappeared years ago and Max Wall also appears as another nutter who has a thing about killing women! Fantastic episode and strangely very amusing somehow! You're right it is amusing in a bizarre way. The light bouncy piano music is strangely counter to the violent goings on. The best bit is when Joanne Petit thrusts a pair of scissors in Eric Flynn's back. Yeah, forgot about Max Wall, he was delightfully creepy. Did you ever really believe that Eric Flynn was the son of Errol? At any time? Like we were told...? Aaarrgh! Yes I did think he was Errol Flynn's son, until FIVE minutes ago when I went to wikipedia. There is a likeness. Eric Flynn is actually the Father of Jerome and Daniel, the two actors known for Robson and Jerome and The Bill! I remember reading a magazine article years back where the writer went into Jerome's family history with Eric being identified as his Dad and some heavy set looking dude being his Grandfather! Now this man looked nothing like Eric at all and didn't even look to be actually real and I've wondered ever since if this was done to conceal the fact that Eric might just, could be, the son of Errol? The effort you are putting into these threads is second to none, Michael. I am planning to watch the whole of my "complete THRILLER series" box set soon. I used to have a ten episode box set which I did watch the entirety of, then gave away when I upgraded. The entire run of the show has always seemed such a quite daunting prospect, but I feel about ready now. 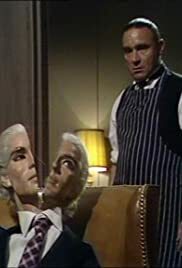 Before I rediscovered the show on dvd, the only episode I remembered was the Michael Jayston as a murderer one. My own personal favourites, in reverse order. 3rd place to the above mentioned Killer in Every Corner. 2nd place is the extraordinary Come Out Come Out Wherever You Are. Peter Jeffrey is unforgettable as Dixon, played with similar panache to his Count Grendel in Dr Who. First place is the creepy Edgar Allen Poe inspired episode ,Kiss Me and Die with Jenny Agutter, Anton Differing, and Stephen Greif along with Russell Hunter. Boz must have really hated NWA Champion Ric Flair too it seems!